Imagine! There are animals living out there on our planet the size of goats, and hardly anybody knows them, because we are not able to depict them. I am not talking about species that have not yet detected by science. I mean big mammals that have been described by zoologists, but nobody ever has managed to clearly visualise them. Good illustrations are missing or photos and names are mixed up. But without proper depictions these species remain animals without identity. Why are we not able to visualise certain animal species clearly? In certain species there are just a few or even no images in proper quality available. Labeling of species changes and hence images of these species are mixed up. We use images to describe species, which do not qualify. Photos of certain big mammals are not available. Why is that? c) some of the species are extremely rare and/or shy. Labeling of species changes. Hence images of species get mixed up. One has to consider that scientific names for species do change. New species can be designated on basis of existing species. These new species have to be labeled with new names. Hence corresponding images can be found with differing names. An example of excessive species name replacement and extensions has taken place in the genus Nemorhaedus. Mead (1989) gives an overview. 27 years ago he assumed that there is only one species of goral: Nemorhaedus goral. Antilope goral, Hardwicke, 1825; Antilope duvaucelii, H. Smith, 1827; Antilope caudata, Milne-Edwards, 1867; Nemorhedus griseus, Milne-Edwards, 1871; Antilope (Naemorhedus) cinerea, Milne-Edwards, 1874; Kemas arnouxianus, Heude, 1888; Kemas henryanus, Henry, 1890; Kemas raddeanus, Heude, 1894; Kemas niger, Heude, 1894; Kemas fargesianus, Heude, 1894; Kemas galeanus, Heude, 1894; Kemas vidianus, Heude, 1894; Kemas xanthodeiros, Heude, 1894; Kemas iodinus, Heude, 1894; Kemas pinchonianus, Heude, 1894; Kemas initialis, Heude, 1894; Kemas versicolor, Heude, 1894; Kemas curvicornis, Heude 1894; Kemas aldridgeanus, Heude, 1894; Kemas fantozatianus, Heude, 1894; Urotragus bedfordi, Lydekker, 1905; Urotragus evansi, Lydekker, 1905; Naemorhedus hodgsoni, Pocock, 1908; Nemorhaedus baileyi, Pocock, 1914; Nemorhaedus cranbrooki, Hayman, 1961. People today mix up the species names. Presumably first of all because of the name changes, but there are other reasons too. I have compared 21.-century-publications that deal with the classifications of gorals. 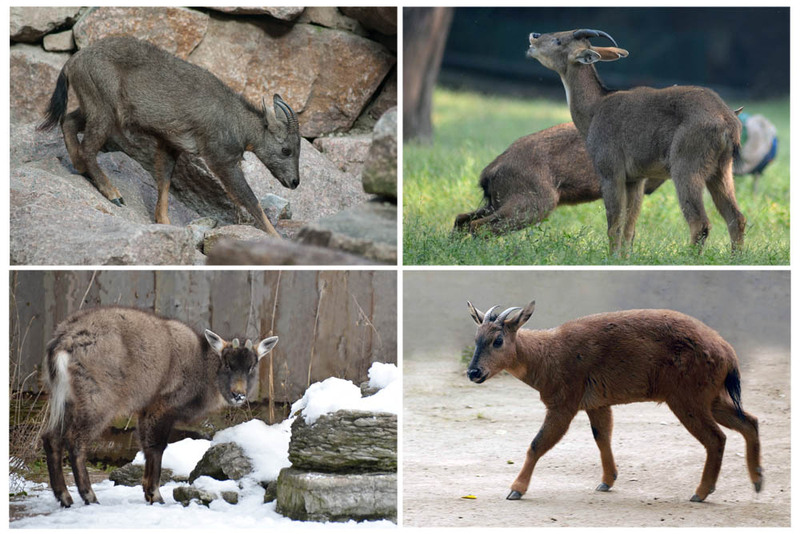 For example IUCN uses the name „Chinese Goral“ for two different species: Naemorhedus griseus and N. caudatus (iucnredlist.org, 2016/04). Groves and Grubb (2011) and Wilson and Mittermeier (2011) have chosen the term „Burmese goral“ for N. evansi, but Damm and Franco (2014) use „Burmese Red Goral“ for N. baileyi. Matschei (2012) uses Naemorhedus goral arnouxianius for the Chinese Goral (N. griseus) – a species-synonym from 1888. Hence an inexperienced reader could take his Central China goral for a Himalayan Goral. Matschei also calls the Eastern Himalayan Goral synonymously „Kaschmir-Goral“, despite the fact that Kashmir lies in the western Himalayas. Damm and Franco (2014) mix up N. b. baileyi and N. b. cranbrooki. 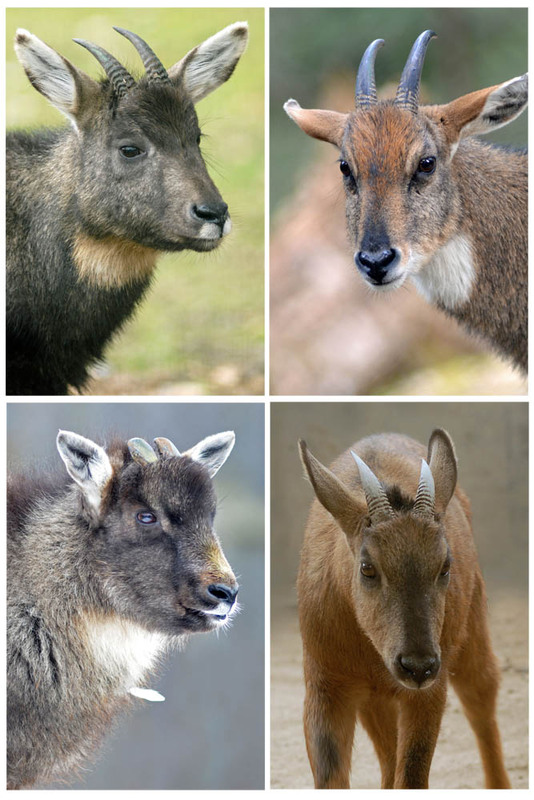 N. b. baileyi is the Tibetan Red Goral; N. b. cranbrooki is the Burmese Red Goral. If you look at less scientific sources, the confusion is worse. According to the name confusion in scientific publications, there is also no consistency concerning the labeling of species in zoos. 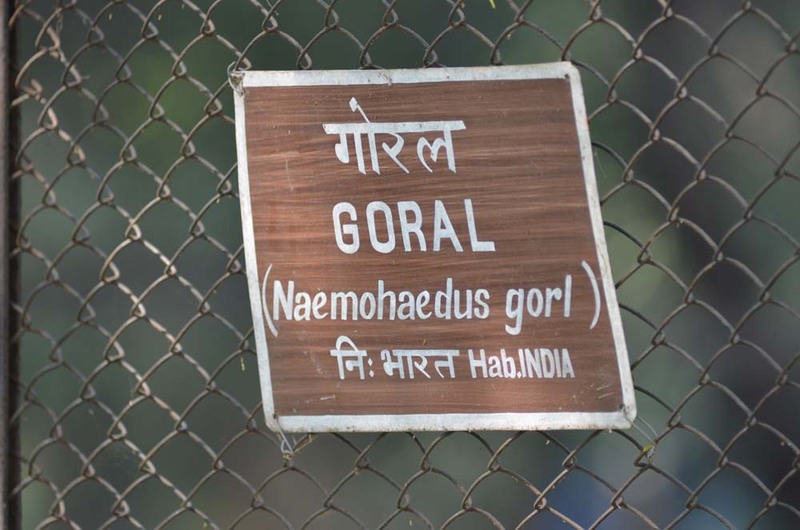 I have checked information boards at various goral enclosures. The following table lists species names from zoos and what it should be referring to agreed scientific state of knowledge. It becomes clear, that apart from misspellings in some cases outdated names are used. 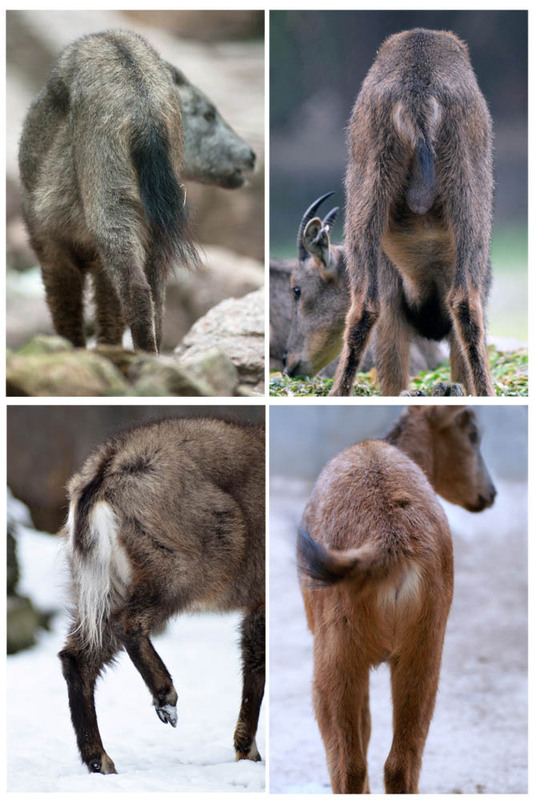 As a consequence visitors in Shanghai Zoo could take a Chinese goral for a Himalayan goral. Or at Tallinn Zoo a Chinese Goral could be regarded as a Long-tailed Goral. 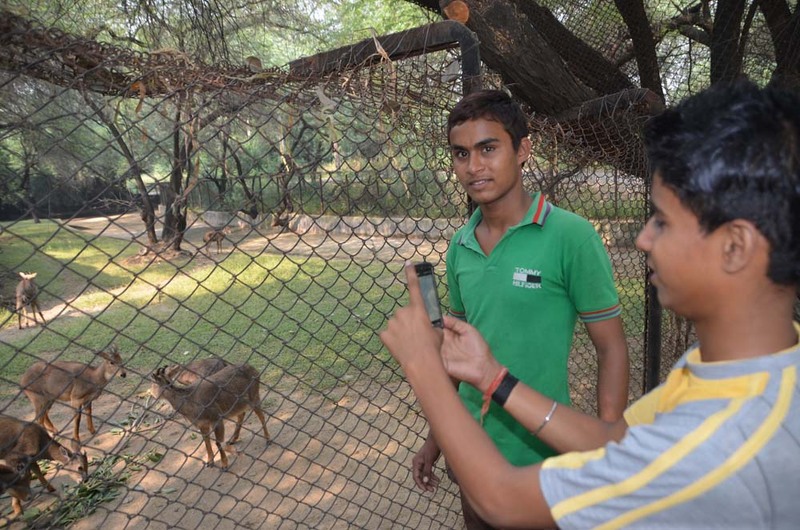 Visitors at National Zoological Park Delhi taking pictures of gorals. In most caprinae species morphologically relevant differences to distinguish closely related species or subspecies show up clearly only in mature males. In immature males, females and most of all in young these differences are not or less developed. Hence it makes no sence to use images of these individuals to depict species. But people do. 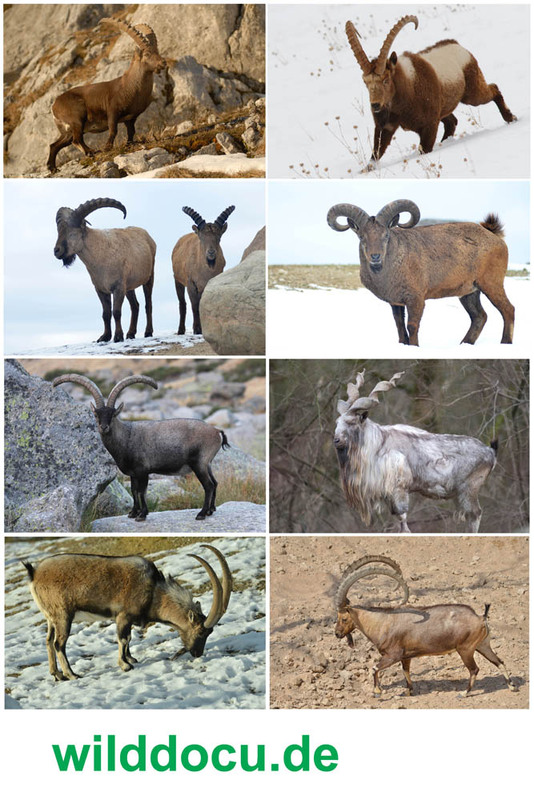 Males of eight ibex species (top left to bottom right): Alpine ibex, Asiatic Ibex, West Caucasian tur, Daghestan tur, Iberian ibex, Markhor, Bezoar ibex, Nubian ibex. – Note that species dependent external differences show up most clearly in horn form and colour patterns. On the other hand colour variations are not only due to physical characteristics of each species, but also to differing light conditions and camera settings. 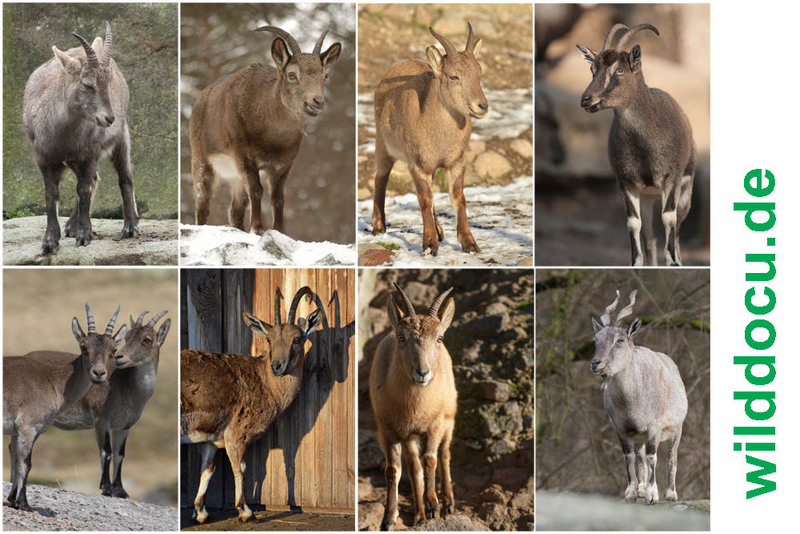 Females of eight ibex species (top left to bottom right): Alpine ibex, Asiatic Ibex, Daghestan tur, Bezoar ibex, Iberian ibex, Nubian ibex, West Caucasian tur, Markhor. – Note only the Markhor with its screwed horns really falls out of alignment. 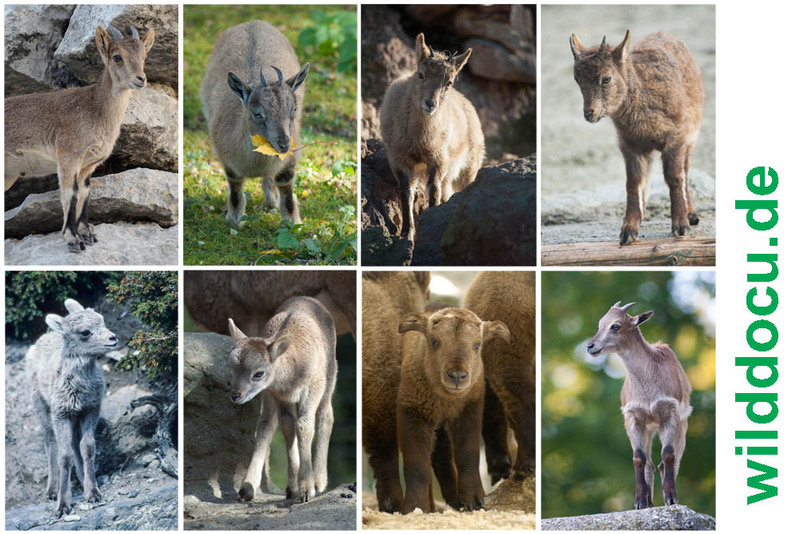 Young of eight caprinae species (top left to bottom right): Iberian ibex, Markhor, West Caucasian tur, Daghestan tur, Bighorn sheep, European mufflon, Golden takin, Himalayan thar. – Note that external differences between immature animals in different species are leveled out even on intergenus level! Only the takin (bottom, 3.) with its sturdy legs and sickle-shaped ears really falls out of alignment. Drawings are by far the best means of showing differences between species/phenotypes, because the artist has the opportunity to idealize depictions. But on the other side artists depend on specimens, live animals or photographs. So the work of artists can only be as good as their references. 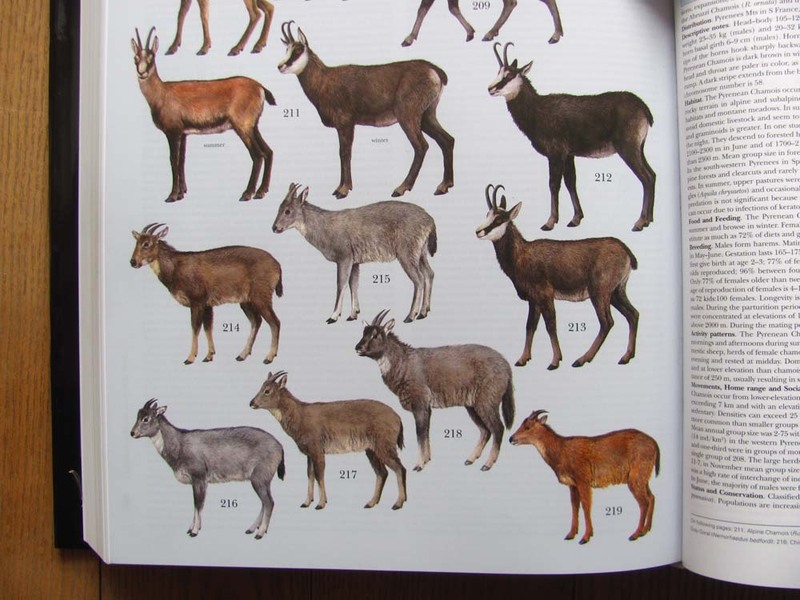 The six Goral species as found in the „Handbook of the mammals of the world“ – Wilson and Mittermeier, 2011 („211“ to „213“ are chamois). Some viewers find it hard to note the external differences in these species. If we want to show animal diversity in detail, we have to look for appropriate animals and use standardised sets of photographs for related phenotypes! Ideally we should also take the photos from the same angle, with the same camera settings, same light conditions, at the same time of year. With the right animals in place and appropriate camera settings we get the photos, that we need. Let’s go exploring and gather more appropriate photos to show how colourful and diverse our mammal world is! Good photos are also a prerequisite for successful conservation work. Damm, Gerhard R. and Franco, Nicolás, 2014: The CIC Caprinae Atlas of the World – CIC International Coucil for Game and Wildlife Conservation, Budakeszi, Hungary in cooperation with Rowland Ward Publications RSA (Pty) Ltd., Johannesburg, South Africa. Duckworth, J.W., Steinmetz, R. & Rattanawat Chaiyarat. 2008. Naemorhedus griseus. The IUCN Red List of Threatened Species 2008: e.T14303A4430834. http://dx.doi.org/10.2305/IUCN.UK.2008.RLTS.T14303A4430834.en. Downloaded on 25 April 2016. Groves, Colin and Grubb, Peter, 2011: Ungulate Taxonomy. The Johns Hopkins University Press. Matschei, Christian, 2012: Böcke, Takine & Moschusochsen. Filander Verlag. Wilson, D. E. & Mittermeier, R. A. (eds. ), 2011: Handbook of the mammals of the world. Vol. 2. Hoofed Mammals. Lynx Edicions, Barcelona. In Caprinae World, Give species a face!